If it’s been a while since you have been planning for weight loss and it is proving to be stagnant; try looking more closely into your diet. If diet is your reason then you could try this spice to boost your weight loss process. This miracle spice is none other than the common Cumin. New research shows that cumin powder can help jumpstart weight loss, decrease body fat, and lower unhealthy cholesterol levels naturally. How can cumin help so much in weight loss? Cumin is rich in phytosterols, plant chemicals known to inhibit the absorption of cholesterol in the body. 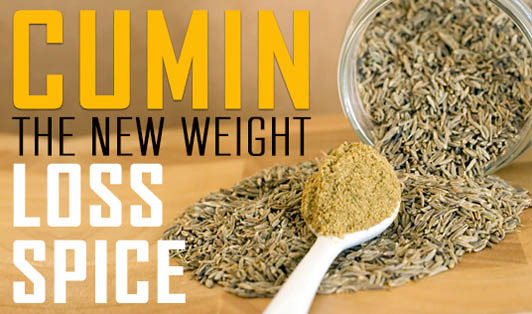 Cumin temporarily increases metabolic rate thereby initiating weight loss. Add ground cumin to curd. Add to boiled or half-cooked vegetables. Cumin pairs especially well with sweet potato, pumpkin, carrot, squash, and cauliflower. Blend ground cumin with chili powder, garlic powder, onion powder, paprika, and ground red pepper for taco seasoning. Add a dash to mayo or hummus for sandwiches and dips. Sprinkle ground cumin into a batch of roasted chickpeas or nuts. You may try your own recipes with cumin powder. Not only does cumin help with weight loss, it also promotes heart health and relieves symptoms of diabetes too.